Hi everyone! Here is a project I've been working on every now and then in the past years. It's my first experiment and it's still growing. It's a customizable monster catching&training game based on GPS for Android, a free app you can find on Google Play. 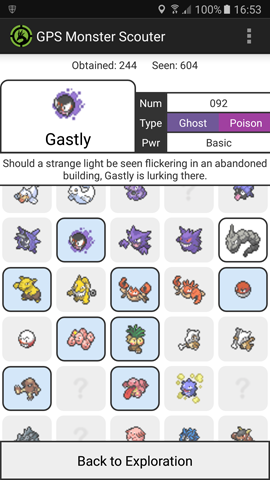 It works with any fanmade data pack containing all the data for a set group of monster, and the main one fans have spent time on is the Pokémon data pack, which is why I'm here. It's very light and doesn't use internet connection at all (after you've downloaded a data pack), which is good news for the battery since gps alone already drains a lot. You can find communities of players for the game on Reddit and Discord, more than 10.000 downloads, 4.2 rate on google play, and lots of users played it for hundreds of hours already, catching hundreds of monsters near their homes and sharing their stories online (which made me really happy). Just a quick note: this game was not created as a competitor for Pokémon GO at all, since concept and development started in 2014 and way before GO announcement, and as you can see below, the mechanics are a lot different and more inspired by pokémon games and anime. I have personally stopped playing Pokemon Go since I picked this up. It is really deep with all the Pokemon elements you would expect. A mon that needs an item to evolve can be evolved. A mon you train up gets stronger. All type advantages are represented to the fullest. Really fun so far. The cool think about this Game is that it works offline, and you can manage your own Save Games. Also it works with older Devices and it is very battery friendly because it is no need to constantly have the screen on. Better than Pokemon Go by 10 fold. Can't wait for an update that will improve upon custom content, after that I have no doubt that the community will skyrocket. Nice! I've been looking for a Pokemon game that requires no WiFi! Good job on this one! So glad to have found this game, needed a good gps game that also works in rural areas and this has not let me down. Ty dev. Works well, and has a good amount of future planned features. The developer is active on the subreddit, and helps with questions, and bugs! Edit for recent updates: Still just as good! If you go on the subreddit, and post a bug, the author is well known to have it fixed in just days, as opposed to weeks or months. This guy takes his app very seriously. And it's free. If you haven't tried it yet, I'd really suggest you give it go. Really the best game for walking discovring the world on the market. Fun and good game, more pokémon than pokémon go. The basic idea is that through the game, the entire real world is composed of regions and routes, and every route is a habitat for a different family of monsters. The common sense for most mechanics was inspired by the pokémon anime, more than the games. Also, this is a game to be played while you're outside, in a matter of seconds. You won't find the depth of canonical pokémon games, because it would take too long to play, and because it must remain generic enough to be adaptable to non-pokémon sets. An important keyword is, EXPLORE. This game's goal is to encourage you exploring, going around outside and discovering new places and things. - Different forms depending on item held, hour, season, etc. Requires android 3.0 or higher. - Imagine being a child in a monster world: you start befriending the species living around your house, and then you begin your adventure exploring the surroundings and finding new monsters to add to your squad. 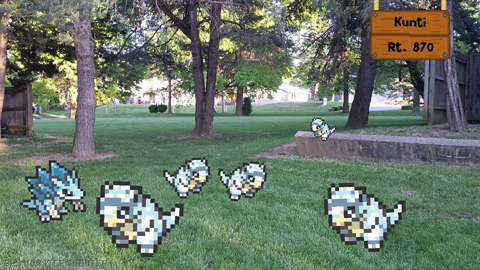 - Monsters are 100% catchable when they are defeated. Simple as that. They're ko, what can they do in that state? - Catch items are precious here! Trainers in the anime don't throw balls at everything, and you shouldn't do it as well. Catch the ones you really like first, and establish a deep relationship with them. - Every region has an established league, 8 gym leaders and 5 elites. As seen in Origins, gyms can be challenged in any order. 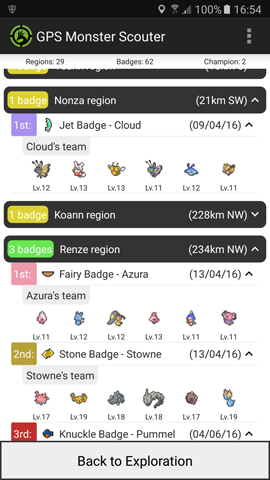 Each gym leader uses a different team depending on how many badges you already have in that region. - Each gym leader or elite always uses a squad of 6. 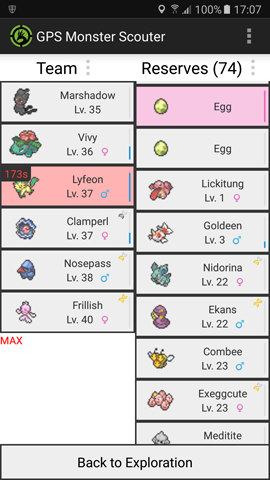 Enough with the easy battles, these guys should be though to beat, and you need a full team to compete with them. - Gyms can be accessed from anywhere. Every gym has its own domain, and every route is placed inside one of these domains, so you always have access to a corresponding gym. 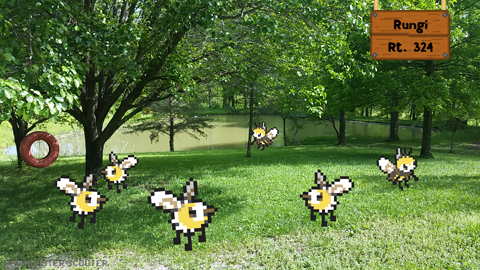 - The wild monsters you find and their levels depend on your carreer as a trainer. 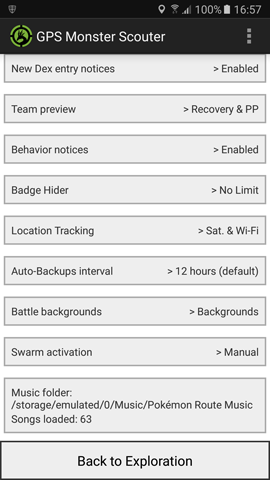 In more detail, they depend on the level of your team and the number of badges in that region. - Each monster has its genetic traits and personality. Monsters in the active team have different interactions with each other depending on their personalities, and you can observe their behaviour. 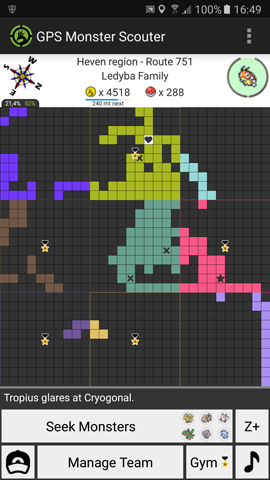 - Region names are generated in a way to resemble known typical region names in monster adventures. There will be different naming algorythms for different data packs. - You can encounter legendaries if you're lucky, but only when you're already a good trainer. - You can find evolution-inducing items on wild monsters. Sometimes they drop the item as soon as they get defeated, otherwise you can catch the whole monster and therefore get its item without fail. - All evolutions are induced manually, not in the midst of battle. When the conditions are met you can evolve the monster from its own options. 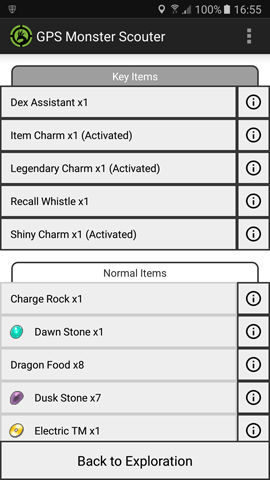 - A monster's options list (long click on its button in the Team screen) lets you give a nickname, assign/remove an item, check the status, evolve, and free. - The game works at its full potential (or should) everywhere in the world. Everything is autogenerated, so there are countless regions and routes, everywhere, all of them perfectly structured. Not a single spot in the world is left behind, no matter how little it is populated. - The game's musics are custom. You can select a folder on your device, and the game will distribute all the mp3s found inside to all routes. On the data packs website you can find a suggested music folder for the pack that you can download and unzip on your device. - The data pack just needs to be downloaded to the 'download' folder of your device, don't try to unzip it. The game will read and use it like that. - The game's options list lets you select a music folder, change the pack (useless for now), go check the web page where data packs are stored, and do a save data backup. Backups are just a countermeasure in case something goes wrong and a bug deletes your adventure. Also, in case of some problem you cand send it to me to check. Hopefully they will never be useful, but, do a backup every now and then. - New Like on 3DS, you gain coins by simply traveling. There's not a max per day, because it's unfair when you go on long journeys, but the distance needed to gain coins constantly increases until it starts over the next day. - New Hold pressed the exploration area, and you will have access to the shop where you can spend coins. 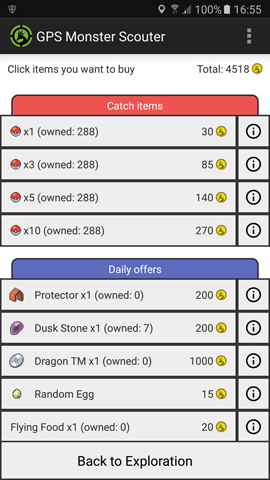 Daily offers change everyday, and every player sees the same items so you can even tell your friends. - New Hold pressed the exploration area, and you will have access to the route marking functionalities: you can place only one home for now, but the other symbols (star, heart, cross, circle) can be used freely without restrictions. The purpose is to mark your frequently visited places and orient yourself better. From the screen of your marked routes, you can hold them pressed and remove them. - New The region view (accessible through the Zoom button) shows where you are (white square), where you've been already (colored squares) and where you've never been (black squares). 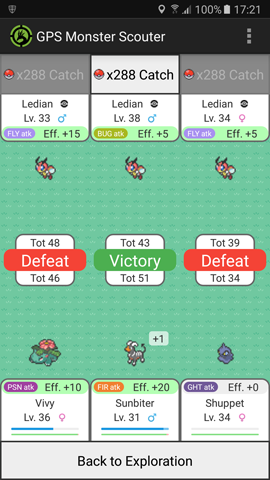 Color of colored squares is a hint to the corresponding gym's type. - New Hold pressed the region view, and you will have access to a highlighting functionality. With this you can research the location of families that you have already encountered in that region. 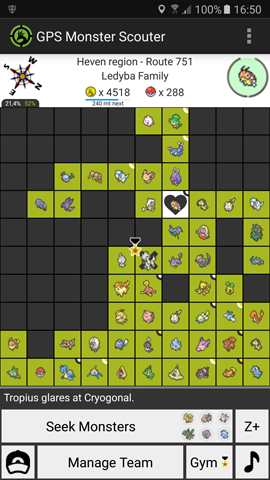 - New Family images have a circle around them, that shows how many new species you can still collect in that particular route. A full circle means that you already have everything you can find in there. A big part of the circle, in black color, refers to the common family. 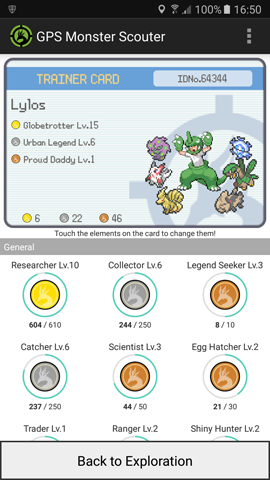 A small section of the circle at the top, in gold color, refers to the rare family (legendaries). - New There's a new item in the shop, the Item Grabber Boost. It does extend your item grabbing range by 20 meters, so you can get hidden items even when they appear in some private property or some house. But remember to be already as close as possible when you buy it, because the effect expires in just 1 minute! - New The new PP system enhances the realism of monsters, who now become tired after using lots of attacks, regardless of the battles' outcome. PP recover over time. - New You can now transfer your adventure to a new device, if you need it. Just do a backup (must be a backup made with the newest version), transfer it to the new device in the same location (the 'download' folder, where even the data pack is), start a new install of the game there and follow the procedure. I consider this a prototype anyway, and I dream of turning it into a more professional and complete game in the future, if I get to find skilled people to work with. I really hope you have fun with it. As I said ANY set of monsters can be made into a data pack for the game. If you want your set of fakémon, or digimon, or monster hunter monsters, or characters from fire emblem or undertale, animals, bugs, dinosaurs, you can do it, any large set of creatures is perfect for it, and I will gladly help you create it. I think the Fakémon option is particularly interesting, because they can also be used to promote an artist work or a fangame. 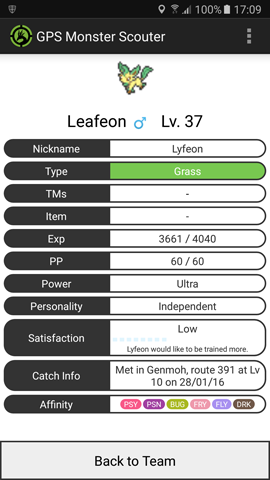 Also for a generic fakémon data pack, with artworks made by lots of different artists, I can add some content in the Dex screen so that the name of the author can be found, along with a link to their website/gallery. Ask away if you have doubts or difficulties. Thank you! This is actually reasonably fun so far. I have played it some tonight at work, and it helped the time go by. Aww I wish I could get this but I don't use my Android anymore. I use iOS..